I don't know how many of you have seen murals like these in kids rooms or in other rooms of homes. We had one in our nursery in our former house and I do miss the big wall mural. Ours was painted, but these are fantastic because they are decals and can be removed as the child grows up. Wall decals are easy to apply, easy to remove, easy to tailor to a specific wall or surface. 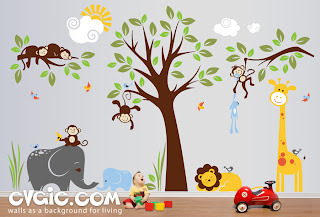 It is very easy with the wall decals to take a plain unexciting room and transform it into a jungle or safari, forest or friendly animals, outer space or the ocean. We all want these rooms for our little ones to spark their imaginations. 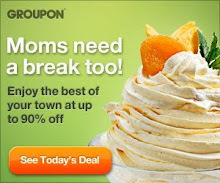 Evgie.com helps to make the decorating easy, fun, and simple! They offer handmade large and small vinyl wall stickers with designs and ideas for kids’ and grown-up’s rooms. So if you would like to make your living room have a custom family photo tree.......you can! EVGIE Studio also specializes in producing customized wall decal designs. They will create a personal design just for you that reflects the ideas you have in mind. They will tailor it to fit your unique space! Disclosure: I received no compensation for this publication. My opinions are my own and may differ from those of your own. Coolestmommy's Coolest Thoughts is not responsible for sponsor prize shipment. This event was organized by Baby Costcutters and Giveaway Booster please contact tina@babycostcutters.com with questions or to see your business or blog featured on the next big event!